Florencesoft TextDiff reports the differences between two text files on Microsoft Windows. It can also compare two folders and remove duplicates from a list. It is ideal for source code, RTF and XML. Text can be either be pasted directly into the application's text boxes or have files dragged onto its desktop user interface. Its text difference algorithm is advanced and systematic. It can even spot a paragraph moved around in a document with reordered sentences, deleted and newly added words. 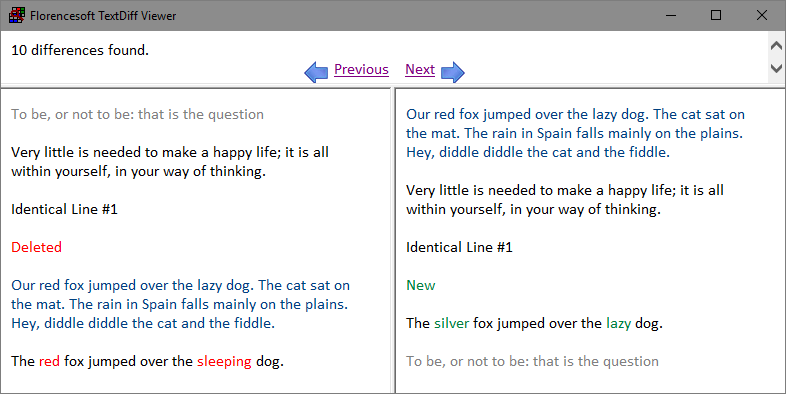 Florencesoft TextDiff is a Windows desktop application and is free to use for the first 30 days. Click here to download the trial software. Non-Windows users should click here. Choice of one combined pane showing all the text changes or two panes with the deleted text in one and the new text in the other. Choice of comparing at the level of whole lines/paragraphs, words or characters. Compares two folders (directories) and reports the deleted, new and modified files. Can omit unchanged text from its difference report, revealing just the differences. Can report duplicated lines in lists and remove them. A truly novel algorithm that can tell paragraph and sentence reordering from other changes types. The colors red and green are used to indicate deleted and new text respectively. The color gray is used to indicate a paragraph or line has been moved down in a document. The color blue is used to indicate a paragraph or line has been moved up in a document. Here is a more difficult case which illustrates the power of our text difference algortihm. The last paragraph in the window on the left has been moved above Identical Line #1. So our software colors it with blue. However the paragraph has also had its sentences slightly reordered. You can see the sentence beginning with the words The rain in Spain has been moved from the middle of the paragraph to its beginning. In total, this sentence has been moved up twice. Once when its containing paragraph was moved up and secondly when it was reordered in its paragraph. We can hardly highlight this sentence doubly blue! The software alternatively uses yellow and light blue to change the background color of words and sentences that have been reordered. Most other text comparison algorithms would fail at this stage and just mark the text with red or green to indicate it has either been deleted or added. It is possible to specify a minimum number of adjacent words or characters before the software will flag them as moved, if appropriate. Unless there is a minimum context, the software could report many occurences of common words such as the and and as being moved. If you are comparing large amounts of text, you should select Show only identical paragraphs near differences or Don't show identical, unmoved paragraphs to spare the user interface from having to handle a vast amount of text. The Next arrow moves to the next change. Next Group skips past any changes adjacent to the currently highlighted change and moves to the next section of changes. 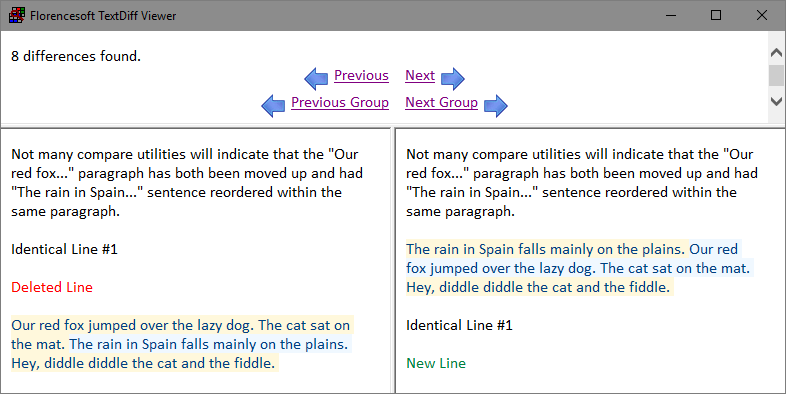 Next Group is useful when you are moving through a paragraph of many, small changes. Increasing the option Minimum adjacent words (or characters) for each move will make the software more judicious in what it thinks should be classed as moved text. If you are comparing lists for added and deleted entries, if it best to select the options Differences should be found at the level of: Whole Paragraph/Line and Don't show any identical paragraphs (the latter option will ensure only changes are displayed and identical entries are omitted). We recommend you use the software's functionaility to remove duplicates before comparing lists, otherwise if an entry is duplicated in one list, but not the other, it will be incorrectly flagged as an addition or deletion. The software ignores non-significant white space when comparing text. It is best to compare at the level of Whole Words or Paragraphs/Lines. Comparing at the character level, especially when Actively look for moved regions is turned on and its associated minimum setting at a low number, may make the software flag too many short regions as moved. TextDiff can compare the text part of two Microsoft Word documents, but only if the desktop version of Word is installed. It will not compare any formatting, graphics, tables or pictures inside Word documents. The desktop version is distinct from the web or online version of Word. TextDiff can compare the text inside Rich Text Format (RTF) documents. It does not compare their formatting.